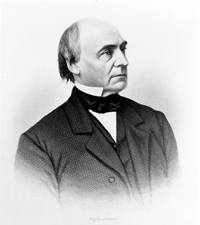 MORRILL, Lot Myrick, (brother of Anson Peaslee Morrill), a Senator from Maine; born in Belgrade, Maine, May 3, 1813; attended the district schools and Waterville (now Colby) College, Maine; studied law; admitted to the bar in 1839 and commenced practice in Readfield; moved to Augusta in 1841; member, State house of representatives 1854, and senate 1856, and was elected president of the senate; Governor of Maine 1858-1860; elected as a Republican to the United States Senate to fill the vacancy caused by the resignation of Hannibal Hamlin; reelected in 1863 and served from January 17, 1861, to March 3, 1869; member of the peace convention of 1861 held in Washington, D.C., in an effort to devise means to prevent the impending war; resumed the practice of law in Augusta; appointed in 1869 and subsequently elected to the United States Senate to fill the vacancy caused by the death of William Pitt Fessenden; reelected in 1871 and served from October 30, 1869, until his resignation on July 7, 1876; chairman, Committee to Audit and Control the Contingent Expense (Thirty-eighth and Thirty-ninth Congresses), Committee on the District of Columbia (Thirty-ninth Congress), Committee on Appropriations (Fortieth, Forty-first, Forty-third and Forty-fourth Congresses), Committee on the Library (Forty-first and Forty-second Congresses); Secretary of the Treasury of the United States under President Ulysses Grant 1876-1877; appointed by President Rutherford Hayes collector of customs in Portland from 1877 until his death; died in Augusta, Maine, on January 10, 1883; interment in Forest Grove Cemetery. American National Biography; Dictionary of American Biography; Talbot, George Foster. "Lot M. Morrill." Collections and Proceedings of the Maine Historical Society 5 (1894): 225-75.